The Troy 12 sided rubber encased dumbbell 5-100LB set is made from solid cast with a 12-sided anti-roll design and encased in virgin rubber, this dumbbells is stylish as it is durable. It resists cracking and fading while protecting floors and equipment. No strong odors. Troy 12 sided rubber encased dumbbell 5-100LB set heads are premanently affixed to a 30mm straight, medium knurled, single forged chrome handle utilizing a steel pin and exclusive bonding formula. No spinning or loosening. Heads are sized no larger than a pro-style dumbbells in diameter, making it more compact and easier to control. Call 1-800-875-9145 to speak with one of our fitness agents about the Troy 12 sided rubber encased dumbbells 5-100LB set. 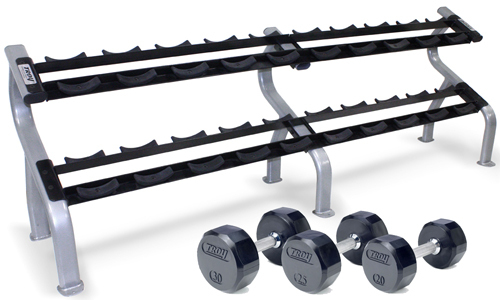 Order your Troy 12 sided rubber encased dumbbells 5-100LB set from FitnessZone.com today! 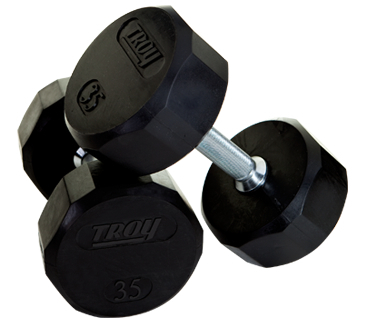 Order your Troy 12 Sided Rubber Encased Dumbbell 5-100LB Set from FitnessZone.com today!